The above quote by Emerson highlights the integrity of students at NewBridge School. However, the joy of learning and the thrill of creativity have often been stifled in other learning environments and our students often come to us frustrated, confused and with bruised self-esteem. Our students’ brains process information differently, so that means we have to teach differently. 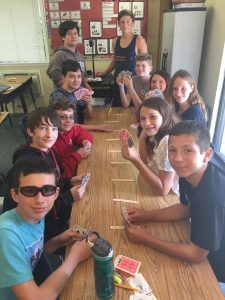 At NewBridge School, students are given the tools and strategies to realize their full potential through strategic, multi-sensory and metacognitive instruction. Although our students may have struggled in other academic settings, they are bright and capable; possessing average to above average intelligence and a strong desire to succeed. Students at NewBridge School quickly discover that they have found their academic “home”. Being with others who share similar challenges allows them to feel safe and comfortable in their learning environment. Once a student feels emotionally secure in their environment, we see their learning take flight! Because of the specialized nature of our program, we are not able to meet the needs of students with a behavioral, social/emotional or psychiatric diagnoses.